Recently we placed an order for a survey: How many people in Germany actually know their way around the sky? Who likes to look up to the sky? The well-established polling institute TNS Emnid conducted a representative study inside Germany and questioned 1003 persons, 14-65 years of age. 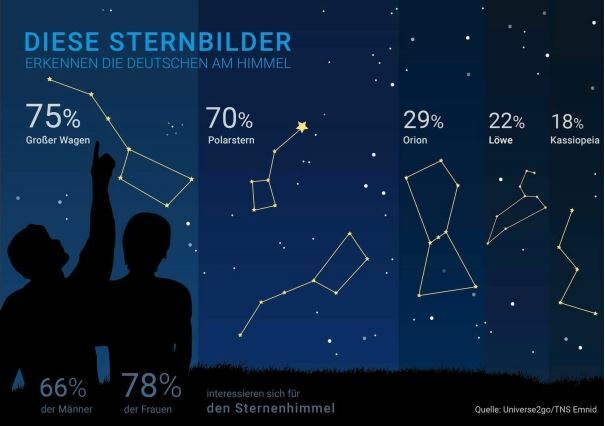 There is still a lot people could learn about the starry sky. Last but not least, there are 88 constellations and innumerable interesting celestial objects. The Augmented Reality Viewer Universe2go in combination with the Smartphone and the associated App not only provides you with a view of the starry sky, but also supplements it by a virtual image of the sky with numerous information and explanations. With Universe2go each person becomes a discoverer and an expert for the starry sky.